I'm not really lost on Mars, of course, but the IMAX film and book Roving Mars have distracted me from blogging for the last couple of days. I saw the film on Sunday and I'm 2/3 through the book. The IMAX film is really great, striking a good balance between the technical/scientific issues and the human interest aspects of building, launching, and operating these complex spacecraft. It's one of the best popular media portrayals I have seen of engineers and scientists, reflecting the truly human nature of their work. And of course the visuals are amazing. It's too bad the movie is only showing at 25 IMAX theaters in the US - maybe if it does well Disney will expand the distribution. Tell a friend! The book by Dr. Steve Squyres covers much of the same ground in much greater detail, of course, but it too strikes a good balance. The writing is clear and the stories of human dedication, technical glitches, and exciting milestones (especially launches and landings) make for compelling reading. And although it's a completely random thought, the fact that Dr. Squyres got both his B.S. (geology 1978) and Ph.D. (1982) at Cornell University makes me think about how my life might have been different if I had accepted the offer to go to Cornell instead of Carnegie-Mellon in 1970. At that time my interests had shifted somewhat from aeronautics and space to computer science, and CMU was (and still is) a top computer science school. It was also in a bigger city and farther from home, and coming from a rural area of upstate New York, I was ready for that change. I now know that Ithaca, NY is a wonderful place (my older daughter went to Ithaca College), and I'm happy with the way things have turned out (not computer science, but physics and optics, with a lot of computer stuff thrown in). But I guess it's normal to think sometimes about the road not taken, and whether it might have eventually led to Mars. Four new books showed up on Friday - two from Amazon (Roving Mars by Steve Squyres and The Wellstone by Wil McCarthy, SF), two that were irresistable bargains at a Barnes & Noble store (First Man by James Hansen and Creation: Life and How to Make It by Steve Grand). I had a few things I wanted to do this weekend, and a couple I need to do, but now these books are competing for my attention. It's not exactly Darwinian - all of them want me to read them, but they will survive if I don't read them right now. The SF is easy - it looks good but it's an airplane read for two weeks from now. But I had to start reading the other three. So far Roving Mars is winning, influenced perhaps by the fact that I'll be seeing the IMAX film of the same name tomorrow with my daughter. 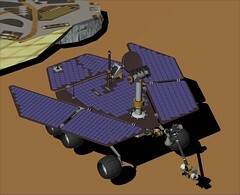 I've reached the part where the the author's science/engineering team has just been selected in 2000 to do the 2003 rover missions with JPL, after trying and failing to be selected on multiple Mars mission proposals since 1987! Planetary science requires great patience, among many other things. But if you do have patience, good technology, a great team, and some luck, good things can happen, even long after you expect them to (e.g., Gusev rocks solidified from lava, a recent report from Spirit in today's Space News Blog). I "discovered" Mozart in Tokyo when I saw the film Amadeus (in English!) while on a business trip there in 1985. Of course I now know that Amadeus is a drama with a lot of fictional and conjectural elements, and having read a few Mozart biographies since then, I know a bit about his life. But I still believe that the film captured something of the spirit of the man, and it triggered a six-year "Mozart odyssey" during which I attended as many concerts and operas as I could (many on business trips to Europe and Japan). I also collected nearly all of his works on CD, along with a good number of books on Mozart and his amazing music, which I still love to hear. One year later I was in Salzburg with a music-loving colleague, where we were lucky enough to spend the weekend between a conference in Innsbruck and a seminar in Munich. It was April 1986 and Salzburg was beautiful (Innsbruck even more so). We did the touristy things, including visiting Mozart's birth house. The dollar was worth something in Europe in those days, and we stayed at a pretty nice hotel where the concierge was able to get us tickets for a small chamber music concert Saturday evening. This is perhaps my best Mozart memory, because the concert was in the historic bishop's Residenz where Mozart and his father had been employed, in a room where Mozart himself had performed many times. Although they played the famous and always lovely Eine Kleine Nachtmusik (K.525), two other works were new to me then but are now among my favorites. One was the Oboe Quartet in F (K.370), and the other the Divertimento No. 11 in D (K.251), the "Nannerl Septet" (written for Mozart's sister). 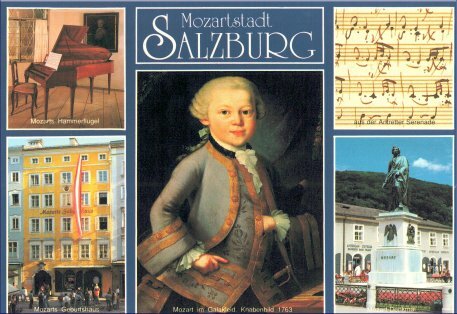 In 1991 I was back in Salzburg (another Munich trip), and that time it was the 200th anniversary of Mozart's death. There were special exhibits and concerts, and I had a great time, although I think my obsession phase was winding down a little by then (it was fall and I must admit that I also took the Sound of Music bus tour, ostensibly because it visited the little town where Mozart's mother was born). In honor of Mozart's 250th birthday, I've been listening to a lot of his music the last few days, and it sounds as fresh and wonderful as ever. So happy birthday to one of evolution's very best results, and thanks for all the gifts! The new Wired magazine has an article about Lego Mindstorms, a programmable extension of Lego building blocks that can be used to build robots and other dynamic hardware projects. In developing the third generation of this product (Mindstorms NXT), Lego enlisted the help of some enthusiastic expert customers to form the Mindstorms User Panel (MUP). Far beyond simply serving as a focus group or beta testers, the four core MUP members actually helped to design the new product (NXT was previewed at the recent CES in Las Vegas, and this blog has some great information on it). These enthusiastic users (three Americans and one Canadian) even flew to Denmark to attend meetings and brainstorming/design sessions - all at their own expense. Why? Of course Mindstorms is just one example - why do some people devote massive amounts of time, energy, and even money to specialized pursuits like this? The article quotes MIT professor Eric von Hippel, who in his book Democratizing Innovation says, "the joy and the learning associated with membership in creative communities" drives people to generously share their time. This really struck a chord with me when I thought about the amount of time I have spent working with Orbiter in the last year, much of it related to its potential as a tool for science education. I spent a couple of months writing Go Play In Space, and since October I have also spent a lot of time writing this blog. Both Orbiter and the "blogosphere" seem to qualify as "creative communities," and I think that is a large part of why I do this stuff. Other bloggers and Orbiter fans have their own reasons of course, but I can't help but feel that the community factor is a part of it for many of us. The new Disney film "Roving Mars" is set to open in selected IMAX theaters this Friday (it looks like the closest one for me is in Providence, RI - surprising that there are no Massachusetts locations). This 40 minute film tells the story of the Mars Exploration Rover (MER) missions, and uses high resolution images pieced together from hundreds of smaller images sent back from Spirit and Opportunity in the last two years. The official site has a lot of information, including a trailer for the movie, production notes, timelines, pictures, and even a PDF educator guide. The New York Times has a good article about the movie and how it came to be made. It really looks amazing and I can't wait to see it. The graphic here is not from the movie, it's from Orbiter (surprise!). The ground-level surface of Mars in Orbiter is not visually impressive (it's made for viewing from high altitude, and unless you install add-ons that create small 3D regions, it's smooth). So you won't be driving the rovers around and looking at rocks. But if you are interested in how the mission was flown, from liftoff in 2003 to the bouncing airbag landings in January 2004, the MER add-on from SimNASA will let you fly the missions for yourself. Every space shuttle launch has necessarily used the huge external tank (ET), and in every case, the ET was made to burn up in the atmosphere. But the ET can reach orbit with only a small payload penalty for the orbiter, and there were a number of studies done in the 1980's and 90's on how they might be used if they were brought to orbit. External Tank Stations 1.0 is a cool new add-on for Orbiter by Alain Hosking ("80mileshigh"), and it really shows what might have been. Although Alain's extensive PDF release notes make it clear that using the ET's to construct space stations as he has depicted would have required solving quite a few problems, it really seems like such a waste to have thrown them all away. 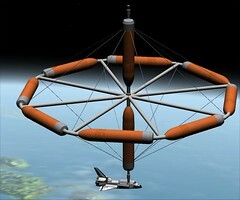 His add-on defines three different station concepts, a Skylab-like single-tank zero-G station, a two-tank counterweight rotating version (2 RPM for 0.8G), and a 70 m torus configuration (pictured) using 10 ET's and rotating at 2 RPM for a Mars-like 1/3 G of pseudo-gravity. It would have been nice to have a station where artificial gravity could have been simulated for extended periods to test this concept for future interplanetary missions. More pix at Flickr. But if you ask me what is a human being, I'd say that we are the species that seeks to go beyond our limitations and beyond our boundaries. We didn't stay on the ground. We didn't stay on the planet. We didn't stay within the limits of our biology. And I would point out that, if it were up to the Luddites, human life expectancy would still be 37, and we'd still be dying from bacterial infections. This quote is from a great interview with Ray Kurzweil, published originally in Ubiquity and republished today on KurzweilAI.net. I really admire Kurzweil not only for his accomplishments and writings, but for his fundamental optimism about humanity, science, and technology. I agree with this definition of being human, and I can't really say it better than Kurzweil has in this quote, and more completely in the interview and in his writings. Anthony on Space: Great Stuff! Trying to keep up with space and science developments can be challenging. There are a lot of space and science news sites, a number of worthwhile space blogs, the new ScienceBlogs.com that I wrote about recently, and much more that I'm probably missing (e.g., the forums and features at nasaspaceflight.com, which I need to make some time for!). Not to mention the books! And Orbiter. Nuclear Fusion Energy: Where are We Now? 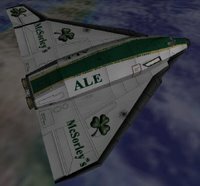 Andy McSorley's space-related "Virtual Spaceflight" (www.virtualspaceflight.com) was one of the first sites I discovered when I started to play with Orbiter in March 2005, and it's still one of the best. It's a nicely organized site with tutorials, links to others' tutorials, information on and scenarios for various add-ons (especially Ken Bolli's wonderful To The Moon in 24 Hours, or TTM24), and much more, including some of his own add-ons. Andy continues to add content to the site, most recently a collection of links to Orbiter videos. He also has interests in many space issues and projects beyond Orbiter and maintains pages with descriptions and many valuable links. Andy is also a frequent and helpful poster at the Orbiter Web Forum, and when I was asking there last summer for someone to test and proofread my in-work tutorial book for Orbiter (Go Play In Space), Andy volunteered and did a great job. He even offered to host the book on his site! Andy is a great guy and a great contributor to the international Orbiter community. Since Andy lives in the UK, I assumed that his McSorley's Ale "skin" (pictured) for DanSteph's Delta Glider III was inspired by a local brew, maybe even something in the family. Nope. He told me he discovered it at McSorley's Old Ale House in New York City! The poet E.E. Cummings was one of many famous people who drank there and he even wrote a poem on it, in which he states that McSorley's is "the ale which never lets you grow old." So it looks like I'll have to get some. If it's true, it could be Andy's most valuable tip yet! On the Way to Pluto! It was a beautiful launch (which I had to watch silently in a tiny window during a video meeting, but at least I got to see it), and now New Horizons is on its way to Pluto! 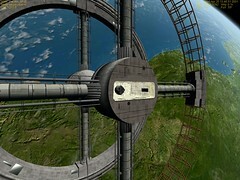 The picture is from an Orbiter simulation of the mission that I discussed here a month or so ago. 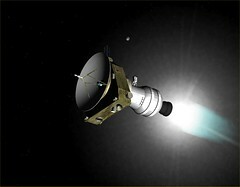 It shows the STAR 48B third stage burning to complete the ejection for Pluto. I love NASA press kits and I love the fact that thanks to the Web, you don't have to be "press" to get a press kit. Or is it that everybody with a blog is some sort of "press?" The 40 page New Horizons press kit is here [1 MB PDF]. 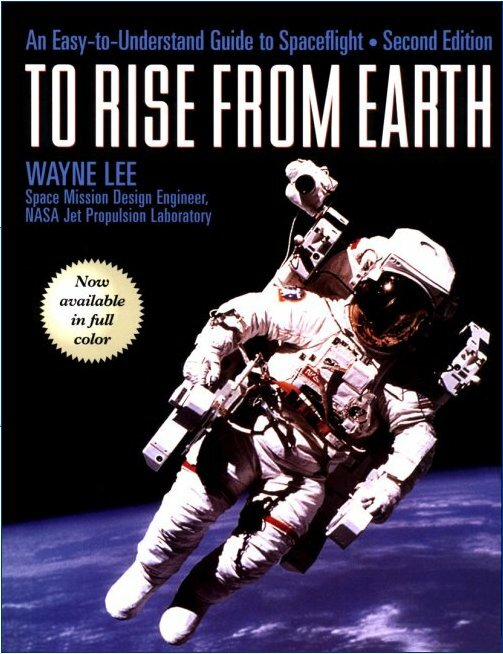 I recently received a copy of a fantastic book for space education, To Rise From Earth by Wayne Lee, subtitled "An Easy-To-Understand Guide to Space Flight." It could serve as a textbook for a high-school level class on space flight, a class for which Orbiter would be the ideal "space lab" to provide first-hand experience with the orbital mechanics and other aspects of space flight described in the book. Both the book and Orbiter provide an essentially non-mathematical introduction to space flight - the book approaches this through geometry, using a large number of excellent diagrams as well as clear analogies and other text descriptions and many photographs. Orbiter takes the first-person approach of putting you in the pilot's seat and providing various instruments to guide you as you control the spacecraft to change orbits, rendezvous with another spacecraft, or fly to the Moon or to Mars. Dr. Wayne Lee has been a space flight planner at JPL for a number of years, working on various interplanetary missions. 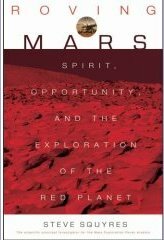 He was chief engineer for entry, descent, and landing for the highly successful Mars Exploration Rover program (there's an interesting interview with Wayne about this here - it says January 2003 but it was really 2004, between the landings of Spirit and Opportunity). 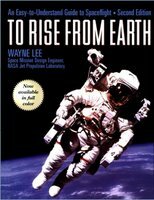 So he is certainly well qualified to explain the details of space flight, and he manages to do so in very understandable terms in this book. The second edition (2000) of the book has 318 full color pages. Chapters are Entering Space (introduction to orbits and rockets), Above the Clouds (orbital mechanics without math), Dancing in the Dark (how to perform space maneuvers), Moonstruck (the story of the race to the Moon), On Twin Pillars of Fire (how the space shuttle works), Final Frontiers (how to reach other planets), and Invading Mars (scientific armada to the Red Planet). There's only one problem - this amazing book is out of print! I contacted the author and he confirmed this. He says he is interested in regaining the rights to the book for possible CD-ROM or web publishing, but he's very busy and doesn't know when this might happen. In the meantime, there are a few used and perhaps remaindered copies of the book available through Amazon affiliated book sellers (and maybe other sources). If you are interested in teaching or learning about space flight, go order a copy right now! Is this live blogging? 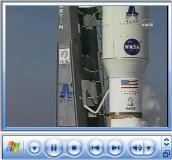 Not exactly, but it is pretty cool that I can put NASA TV in a Windows Media Player window, shrink it down to a little tool-bar mini-TV, and keep an eye on it while working (and um, blogging), waiting for Atlas Launch Control to resume the countdown from the T-4 minute hold to launch at 1:45 p.m. EST, about 6 minutes from now. Their only remaining concern is some wind gusts that may be a little outside their launch parameters. They have released some balloons and are waiting for updated winds aloft. The other stations are all reporting "go" for launch at the moment. Update: OK, I posted and they immediately pushed it back to 2:10 pm to allow more time to evaluate the winds! The launch window today extends to 3:23 pm (I think that's what he just said), so I better get back to work and just wait for the launch! I'm sure there will be lots of blog and other web coverage of this mission to Pluto/Charon and the Kuiper Belt. I wrote about the mission (and simulating it in Orbiter) back on December 5. Final update for today: Launch time was pushed to the end of the window (3:23 pm EST), started from the T-4 hold, and aborted at about T-2 minutes. Try again tomorrow. Maybe everybody knows about HubbleSite and its amazing gallery pages, but if not, check it out. One-stop (free) shopping for information and many, many spectacular images from the Hubble Space Telescope. Makes me proud to be an optical engineer, and to work with several engineers who made major contributions to the design and fabrication of the Hubble repair optics. My company even received a NASA award (in 1995) for its work on the Hubble and other NASA projects. The image is of the Cat's Eye Nebula (NGC 6543). I haven't been flying much lately, but I do know that since 9/11, it has become very important to plan your flights carefully and to pay close attention to NOTAMs, TFRs (temporary flight restrictions), and various restricted airspaces, lest you wander into the Washington, DC "temporary" ADIZ and wonder why you are suddenly flying in close formation with a Blackhawk helicopter or an Air Force F-16 (as happened in May 2005 to a couple of Pennsylvania men flying a Cessna 150 - the pilot had a hand-held GPS but left it in his car). 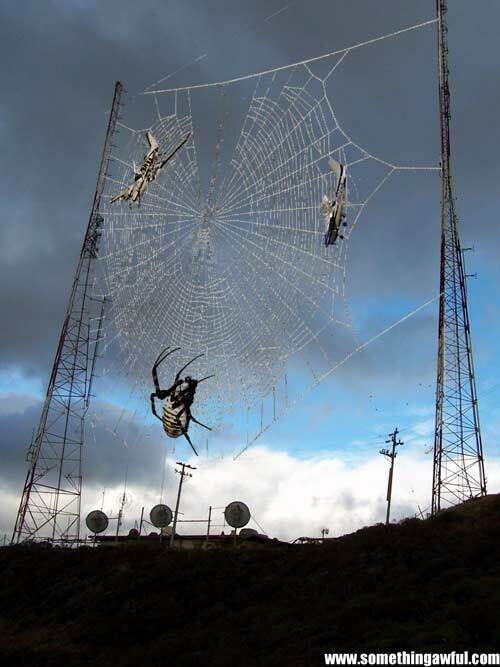 Even worse things could happen, as shown in this picture at somethingawful.com. In a recent post, I wrote about some humorous comments on science made by fifth and sixth graders. Another one I liked was “Many dead animals in the past changed to fossils while others preferred to be oil.” It’s fortunate indeed that those long-dead animals (and plants) were watching out for us that way, because our civilization has been built on the oil and coal they eventually became. Of course all that fossil fuel energy originally came from the Sun, captured in a long process that started with photosynthesis in ancient plants. It turns out the Sun has been storing up even more energy for us, in the form of helium-3 captured in the Moon’s soil (more properly regolith) from billions of years of solar wind. Earth’s magnetic field protects us from most of those charged particles, but the Moon has accumulated an estimated million metric tons of the stuff (forty metric tons is the energy equivalent of all the power pumped into the US power grid in 2005). All we have to do is go there, collect it, bring it back to Earth, and “burn” it in helium-3 fusion reactors that are in the earliest stages of development. OK, there are a few non-trivial steps to complete there, about thirty years worth unless somebody picks up the pace. “Somebody” could possibly be the U.S. government – or the Chinese. I had read other things about the promise of helium-3, but today’s Space Review interview with Dr. Gerald Kulcinski (director of the Fusion Technology Institute at the University of Wisconsin) is the clearest summary I have found. Fascinating reading. In a New York Times Op-Ed piece, Robert L. Park reports on the quiet cancelation by NASA of an Earth observing satellite called the Deep Space Climate Observatory, also called Triana. Positioned at the L1 Lagrange point, it would have had a continuous view of the full Earth and carried instruments to monitor the planet's energy balance, contributing to our understanding of global warming. Although "competing priorities" were cited, Dr. Park also points out that a better understanding of global warming is not exactly one of the Bush administration's highest priorities. There are other Earth monitoring satellites, and I know there are other priorities for NASA and the US government. But it really seems unfortunate that this relatively low cost spacecraft (which has been ready for launch since 2001) will not be used for this important mission. NASA's Stardust Comet Sample Return Mission is on track to land (mission timeline here) in Utah early Sunday morning. Thanks to add-on maker Brian Jones, it's possible to simulate the Stardust mission in Orbiter (the add-on has been available for a while on avsim.com). Another Orbiter user (Donald Tinc) has helpfully posted updated orbital elements the last few days as the spacecraft has approached Earth. By text-editing Brian's return scenario file (he also provides a launch scenario and a simulated comet to visit, but I didn't try those parts of the mission myself), I introduced the updated elements from earlier today and simulated Stardust's reentry and landing. Brian also provides a tip in that forum post for an adjustment to a drag factor in the capsule's initialization file. This helps the accuracy of the reentry (without this, my first attempt seemed to skip off the Earth's atmosphere). If you start with the "close-in" orbital elements, all the course corrections have been incorporated, and the only real control you have is when to separate the return capsule from the "bus" (I followed NASA's timeline) and when to deploy the drogue and main chutes (the separated capsule has no maneuvering thrusters). You can also try (as NASA will do successfully, I'm sure) to maneuver the bus spacecraft after separation to get it to miss the Earth and enter a solar orbit. I need some work on this part, but my landing was pretty good -- at least it was in Utah, about 190 km southwest of Salt Lake City, near the Nevada border (map and other graphics on Flickr). Now I'll really be interested to see where the real spacecraft lands (Update on January 15: it landed safely in the Dugway Proving Grounds near Michael Army Air Field, about 90 km northeast of my simulated landing). Note that although I did not try it myself, Orbiter is accurate enough to recreate the entire seven-year mission from launch, including three orbits of the Sun and a gravitational "slingshot" around Earth to set up the comet encounter. I just did the easy stuff tonight! P.S. For an excellent summary of scientific aspects of the Stardust mission, see this new post by Anthony Kendall. This New Scientist graphic is a great visual summary of the successful mission. ScienceBlogs is the web's largest conversation about science. It features blogs from a wide array of scientific disciplines, with new voices coming on board regularly. It is a global, digital science salon. It's great to have such a diversity of science related blogs "under one roof." ScienceBlogs is part of the Seed Media Group, publisher of the new science/culture magazine Seed. I bought my first issue last night. I learned about both Seed and ScienceBlogs on Anthonares, yet another useful tip from Anthony's blog. That last post about ion engines got me thinking about trajectories and Orbiter. With continous or long-duration thrust, as would be typical with ion engines (even higher thrust, next-gen ion engines will be relatively low thrust compared to chemical rocket engines), things are not so simple in terms of trajectory planning. If you do a Google search on "orbital mechanics low thrust" you will find references to "trajectory optimization" and many other things related to ion engines as well as solar sails (here's a paper [PDF] that uses an evolutionary algorithm to optimize low-thrust orbits). Many common maneuvers (such as raising the apoapsis by thrusting pro-grade at perapsis) are based on the assumption that the thrust is applied instantaneously (or at least for a short finite time). A simple Hohmann transfer orbit is essentially this, and ignoring perturbations and mid-course corrections, requires only two "burns." If you apply thrust continuously, the energy of the orbit (and the orbit itself) changes continuously, and you end up with some sort of a spiral trajectory. Here's a page that discusses some of these issues and has some charts that could be useful for planning. 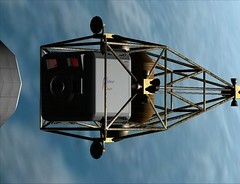 I wondered if there are ion-engine-powered spacecraft for Orbiter, and I found one, Soltech v1.1 by "spacingbluefrog." This looks pretty cool, and it includes a Moon base and 2D cockpit panels, a pretty rare thing in spacecraft add-ons. I haven't tried it yet, and the author warns that the low-thrust behavior is tricky to manage in Orbiter. This looks like a promising area for a future MFD add-on (trajectory planning/control MFD for low-thrust propulsion), but I don't know how much demand there is for this right now. There has been a lot of recent discussion on a kind of "hyperdrive" space propulsion system that might be a possible application of Heim Theory, a theory of physics that at least partly integrates General Relativity and Quantum Mechanics. Burkhard Heim's theory is complex, relatively unknown, and not well understood by most physicists, but it has had some success in predicting the mass of certain fundamental particles. The recent paper (PDF) that describes possible space propulsion applications is what triggered the flurry of discussions. I've read it but I can't say I find it really compelling - to be honest I can't say I really understand it! Although aspects of this proposal are testable, there is a heavy aspect of "if it really turns out to work this way" in it. But physics is by no means "complete" and maybe Heim Theory is part of the next step in understanding the Universe. I certainly hope it's valid and that it leads to a propulsion system that can get a ship to Mars in five hours. It would also be nice if it leaves the space-time continuum pretty much intact for the rest of us. There's a good overview on Damn Interesting. Less dramatic but still pretty amazing is a breakthrough in ion engines by ESA and ANU, reported on Space News Blog. By decoupling the ion extraction and acceleration stages of the engine, much higher acceleration voltages can be achieved, and the test engine produced an exhaust velocity of 210,000 m/s, over four times faster than current ion engines. Thrust is still low, but the design is also much more scaleable than previous designs, opening the possibility of using ion propulsion even for large planetary spacecraft. There's much development to do, but this is an exciting development! I have something of a completeness obsession. If I buy a book that's part of a set, I usually end up buying the set. When I was collecting CD's for my major Mozart phase in the early 90's, I had to have all 626 Köchel numbers (I don't think I got all the a,b,c, etc. versions though, and I think I missed some of the choral pieces). Over at Orbit Hangar just now, I happened to notice an Orbiter add-on that reflects a similar completeness obsession, "Space Race Complete." The author has compiled 341 dated scenarios from the launch of Sputnik to the ISS and just about everything in between. Pretty amazing. A supplement adds 36 more scenarios from 1996 to 2001, ending with the de-Orbit of Mir in 2001. These are only the scenarios, not the add-ons needed to run them, which are listed in the readme file. The zip file dates from mid-2004 so some of the add-ons it references are not the latest ones for Orbiter 2005, and I haven't tried any of them yet myself. But it's pretty impressive and would make a good accompaniment to This New Ocean, the history of the space age that I read in December. Today's Space Review has the second part of Grant Bonin's article on the case for smaller launch vehicles in human space exploration. He makes a lot of good points, the biggest one being that NASA's plans to spend $10 billion to develop a shuttle-derived heavy lift launch vehicle will have the effect of putting too many eggs in one basket - again. And it won't be available for a long time. Planning to use multiple medium-lift vehicles (some of which are operational already, with more in the pipeline) offers diversity and options, although it requires changes to the major human mission architectures, requiring multiple launches and on-orbit assembly. Critics say that the MLV approach is too complex and has too many risks, but it seems that both approaches have risks and complexity, they are just distributed differently. The MLV approach deserves a closer look in my opinion. If multiple non-crewed MLV launches are used to get the parts for a Moon or Mars mission into orbit, how will they be assembled there? Rendezvous to the near-vicinity of an orbiting object is pretty routine - Orbiter users do it all the time! Seriously, even in real life, automated rendezvous is not that hard these days (e.g. the Russian Progress resupply vehicles for the ISS). But you would need to have some sort of "space tug" to move the parts around and assemble them without requiring astronaut EVA's to do everything. I don't know where development stands on such a vehicle, but Orbiter has one you can practice with, the Dragonfly. Even though it lacks any sort of robot arm (which I assume would be a practical requirement for many tasks), it has a docking port and can dock with objects that have a docking port (such as the supplied practice space station modules), move them around, and dock them with other modules. The picture shows a closeup of the craft (more on Flickr). 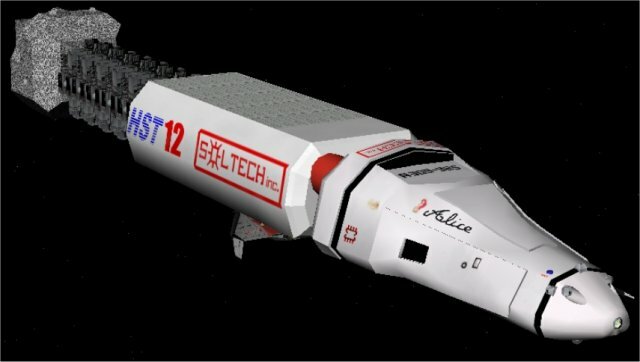 This is a short-range space-only vehicle with thrusters only (no main engines). It also has detailed panels and internal spacecraft systems (and its own 22 page PDF manual). N.B. I decided to look up space tugs in Google, and I find the term applies also to robot (or remotely operated) spacecraft, including one that has been proposed by Orbital Recovery Corp. to boost satellites to higher orbits. Such a tug could possibly be used to save the Hubble Space Telescope without a Shuttle mission, and perhaps they could also be developed for use in some on-orbit assembly jobs. As is often the case, the weekly email from KurzweilAI.net has some mind-blowing stuff in it. I may be a bit behind the power curve on this, because while I had read something about quantum dots (mainly related to quantum computing and as a light source), I had not really heard of the idea of using them to create configurable or programmable matter - materials whose optical, electrical, and even structural and other properties could be altered on command - programmable matter. It sounds like science fiction, but Wil McCarthy published a book on this in 2003, Hacking Matter. He recently added some updated comments to it and released a free multimedia PDF version of it which was the news item from Kurzweil. Just a quick browse so far, and it looks to be amazing, potentially world-altering stuff, and not as far off as even McCarthy imagined in 2003. He has patents pending and a company working on it! He's also a SF writer, so I checked out his books on Amazon and ordered a couple. His free PDF turns out to be smart marketing too. I've been helping out with some research for a school project on space and the environment the last few days. Although I have often explored their many web sites, this project really highlighted for me the amazing amount and high quality of the on-line resources available from NASA. Whether it's historical information on the Apollo program, educational support, current mission information, or regularly updated Earth sciences data, NASA has it all. The only negative thing I would say is that because the various NASA centers have their own web sites, it can sometimes be hard to find exactly what you need. But Google usually comes to the rescue here, since a search with the keyword site:nasa.gov is usually more effective than NASA's own site search feature in finding the "good stuff." For example, searching for explorer 1 site:nasa.gov returns top-10 results from jpl.nasa.gov, gsfc.nasa.gov, history.nasa.gov, and solarsystem.nasa.gov. 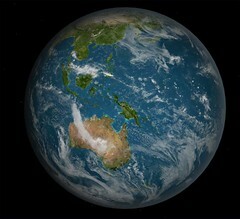 One area I had not explored much before is NASA's various Earth science sites. One particularly interesting one is on the water and energy cycle. It includes a fascinating (but big - 45 MB) animation of the major components of the global water cycle. The Federation of American Scientists (FAS) has as its mission "to promote humanitarian uses of science and technology." It collects and distributes (mainly through its web site) a wealth of information on technical and defense issues, as well as independent and knowledgeable evaluations and policy recommendations. It has also set up the Learning Federation to promote and help create "radically improved approaches to teaching and learning enabled by information technology." I found an interesting FAS paper on the use of games and simulations to improve teaching and learning, something that is familiar to all video game players and that has been applied with great success by the Defense Department. Closer to home, it's one of the reasons I'm excited about Orbiter as a tool for helping to make certain aspects of science more interactive and intriguing to kids. FAS also collects and makes available a variety of otherwise hard to find documents related to weapon systems, terrorism, weapons in space, and other topics. The archives of their Space Policy Project contain a lot of useful information including a World Space Guide. 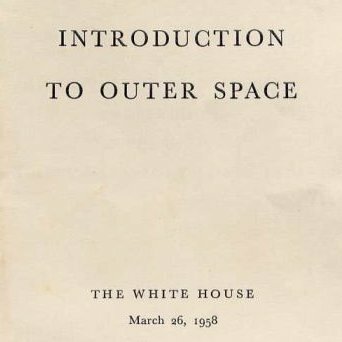 In the USA section, Andy recently pointed out a document that I had been searching for, the 1958 pamphlet Introduction to Outer Space. 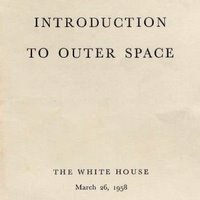 Published by the White House just two months after the launch of Explorer I, this 15 page document gives an amazingly accurate preview of the development of space. It's surprising just how much President Eisenhower's Science Advisory Committee got right at that early date. Interesting reading! 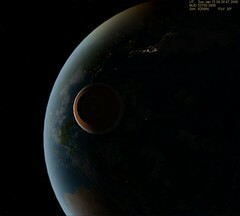 One of the things I'm trying to do is to develop a teacher's guide for Orbiter, because I believe that as a dynamic, graphical solar system simulator, Orbiter can really enrich lessons in science for a variety of topics (the appearance and motion of planets, sunrise/sunset, eclipses), in addition to its more obvious role as a space flight simulator that demonstrates forces and motion, rotation vs. translation, the effects of gravity, and the various technologies and applications of space flight. So far I've written a presentation [PDF] that gives a visual tour of Orbiter, suggests an interesting demo, and includes some notes for teachers. 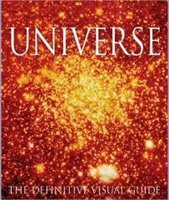 Yes, I'm in love with (the) Universe, a gorgeous new book from Dorling-Kindersley. I saw this huge 500+ page book last week at Borders for $50, but delayed gratification long enough to get home and order it for $31.50 on Amazon. Like most DK books, it is heavily and colorfully illustrated, and beautifully designed, but the range of subjects and depth of information is greater than for a typical DK volume. Edited by Martin Rees of Trinity College, Cambridge, with the help of a team of specialists, this is basically the most comprehensive general-interest astronomy reference I've ever seen. Wow. My book backlog is growing. My neocortex has just finished On Intelligence by Jeff Hawkins (companion web site here, and the company formed by Hawkins to develop technology based on the theory of Hierarchical Temporal Memory [HTM] described in the book is Numenta.com). On deck are Project Orion by George Dyson, Earth (an introduction to physical geology) by Tarbuck & Lutgens, Our Final Hour by Martin Rees (see above! ), and Collapse by Jared Diamond. After these, I think I will try to find something serious to read. I happened to be browsing through a blog from the space blogroll, Tales of the Heliosphere, and I noticed a post on the valuation of blogs. The writer had found a blog value calculator, using the Technorati API, and based somehow on the same link-to-dollar ratio as the AOL-Weblogs deal. He reported that his blog was worth $0.00, so I typed in my blog's URL, fully expecting the same result. But it said my blog is worth $10,161.72. Huh?!? I'd like to believe that this funny money figure is based on the wisdom, humor, quality, and quantity of my blog's entries, as well as its vast readership, but I believe it is more likely due to the fact that I've been on the space blogroll for a couple of months. Technorati says this blog ranks 132,494 (out of how many? ), with 28 links from 20 sites, most of them no doubt from other space blogroll members. Almost Famous is a good movie, but it does not describe this blog, alas. Although there are a few recent posts on the forums, most of the site seems to date from 2004, and I don't know its status. But it looks like there are a lot of valuable materials (including a book) and interesting ideas, so I plan to look around some more. The Space Review has some great articles this week. I especially liked Grant Bonin's article on the case for smaller launch vehicles (first of two parts). There has already been some interesting discussion triggered by this on several blogs, including Space Politics. The article on lasers and directed energy weapons is good too, although this isn't the proudest application of my professional field of optics. Of course the same adaptive optical techniques needed for long-range laser weapons can also be applied to power beaming for space elevators and other applications. The MarsDrive Consortium (“MDC”) is a group engaged in bringing together like- minded individuals, groups and businesses for the purpose of raising the large scale public support and necessary resources for an actual human mission to Mars within the next 2 decades. I strongly support these goals and will do what I can to help, using Orbiter as one of the tools. To that end, I wrote a short piece on Orbiter for the MDC web site. The visual imagery of Orbiter can be really amazing. I've just seen some beautiful new screen shots by various users over at the Orbiter forum (check this post), and I also took a look at a new screen shot gallery web site, Mercury to Mimas. "SilvaHeed" already has a number of great shots there, and I really like the organizational approach of showing a series of labeled pictures from a mission to Mercury, Mars, or the Moon. Even a simple "storyline" can give a sense of purpose, place and time sequence. My own Flickr site exists mainly to illustrate this blog and is more random than this (though I usually post a few related pictures at a time). My gallery has grown to some 150 images to date (sample above is Station V from the film 2001: A Space Odyssey, part of the great World of 2001 add-on for Orbiter). Flickr is free and automatically stores pictures in multiple sizes so it's easy to set up your own gallery. New Scientist has brief, heavily linked summaries of 2005 in the solar system and in human spaceflight, among other news and summaries of 2005. Great essay on why we're going back to the Moon (Washington Post). Andy pointed out that the January issue of the British astronomy magazine BBC Sky at Night includes Orbiter on its cover CD. Perhaps we will get a few new Orbinauts from this bit of publicity. I wrote about this magazine recently and it's rather good, though it takes a month or two to reach US book stores. I'm reading a book called The Ascent of Science by Brian Silver. It explains the major scientific developments of all time in concise, clever, personal, and often humorous terms, and it also discusses the social context of scientific and technological developments. Wonderful, rational, readable stuff - it reminds me of some of Feynman's writing (e.g., his Lectures on Physics, but with less technical depth than those, more for the general reader). This has jumped to the top of the reading stack but the book is huge so it will not travel well. Fortunately I have no trips planned until the beginning of February.